To vote first CLICK on the graphic below and THEN click like. If you are happy to vote, I would be very grateful ... thank you so much! Time has sped by and Diamond Sky has been in the stores for three months already! The first two Prickle Creek Farm books have been released, Book 3 is in edits and I am writing Book 4 now. I've just come back from another wonderful trip to the Whitsunday Islands. What a wonderful place to visit... make sure the islands are on your bucket list. Some photographs to entice you! I am re-releasing a previous book in November. Hot Rock has been rewritten, and I have added new characters and a much deeper story. COME BACK TO ME will be the first book in the Love Across Time series and will be up for pre-order today! The two weeks since the release of Daintree have been busy with book signings, libraray visits and talks, and radio and newspaper interviews! There have been lots of shelf sightings of Daintree all over the country from Cairns to Perth, to Tasmania, and even one across the Tasman Sea in Wellington, New Zealand! When I was in Sydney, I was asked for a photo by the zany Costa Georgiadis ...he liked the flowers in my colourful dress! It was World Soil Day! An exciting day today...two weeks to release, and my copies have arrived. They are so pretty! My first review went up on Good reads and I was delighted to read it! 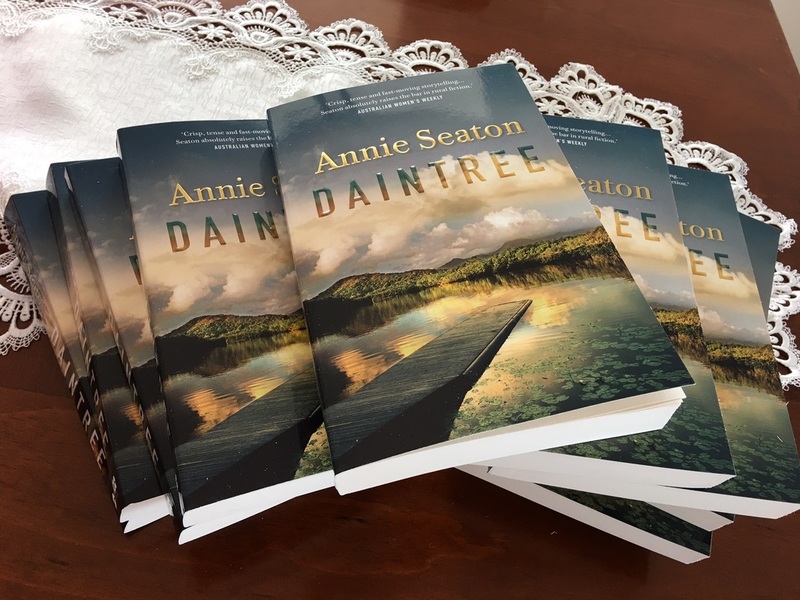 Daintree by Aussie author Annie Seaton is the second in The Porter Sisters trilogy and as utterly gripping and intense as the first, Kakadu Sunset(Ellie’s story)! With a fast paced, brilliantly crafted plot, the suspense and intrigue was well done. I loved the descriptions of the Daintree; the research which obviously went into Aboriginal healing using leaves and roots from the bush – the gorgeous birds and deadly creatures (which weren’t so gorgeous!) Daintree is one I highly recommend and I’m really looking forward to book 3 which I guess will be Dru’s story. Romantic suspense at its best! I am delighted to announce that Kakadu Sunset has been shortlisted for the RWA Romantic Book of the Year 2016 in the long romance category, and nominated for the Sisters in Crime Davitt Award. ​March and April, I have several library talks scheduled. Click on my media and events page above for details. February: Exciting news. I have been successful in gaining representation for US and international sales with Trish Skinner at Fuse Literary. I now have an agent looking after my work! Hollywood here we come! January: Was spent on the promotion trail and what fun that was! Radio interviews, newspaper interviews, book signings and library talks. A whirlwind of activities. 22 December.... RELEASE DAY... we have lift off! Book 2 of the Porter Sister series, Daintree Sunrise, is with my editor , and I am well into the research and writing of Book 3, Kimberley Moonlight. ​1 December: I was delighted to hear that I was awarded Best Established Author 2015 in the AusRom today Awards. A fabulous honour as it is voted by readers. My lifelong dream was realised this month when Kakadu Sunset became available for pre order. You can pre-order it in e-book format from the following retailers. It will also be available in the stores in paperback on December 22. August: I visited Melbourne to attend the annual conference of the Romance Writers Association of Australia. It was wonderful to catch up with writer friends, meet and make new ones, and talk with publishers and agents. The ARRA book signing was great fun and it was lovely to connect with readers too. I am currently immersed in Book 2 of the Porter Sisters series...Daintree Sunrise and am enjoying researching the Wet Tropics. December- Mark your diary! I'm very excited to say that Book 1 of the Porter Sisters series, Kakadu Sunset, will be available in Australian and New Zealand book stores and on line internationally on 22 December 2015.